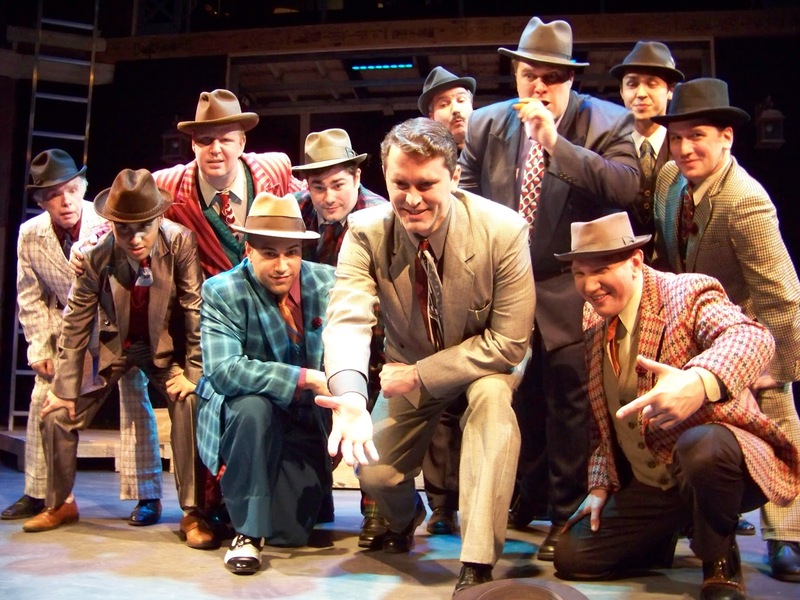 To enjoy a grand night of singing and superb ensemble acting, one can’t do better than attend The Majestic Theater’s Guys and Dolls. Director Rand Foerster’s production of this classic musical features fast pace, lovely voices, sharp choreography, eye-catching costumes, a splendid orchestra and quality performances throughout. It is wonderful to watch a vintage show brought so nimbly to life and laughter again. Much of the show’s charm derives from the over-the-top Damon Runyon New York characters and ridiculous dialogue, which are handled ably by this talented cast. Buzz Roddy as Nathan Detroit and Annie Kerins as Adelaide are perfect examples. These actors possess stop-notch comic timing and fabulous facial expressions. Kerins really shows her stuff in the number “Adelaide’s Lament,” proving that you can still make something marvelous out of what many folks might consider an antique show tune. Leading lady Rebecca Flinker as Sarah and Billy Clark Taylor as Sky Masterson are charming as the unlikely lovers at the center of this story. Their singing of “I’ve Never Been In Love Before” soars effortlessly, and the harmony is beautiful. Of special note are the male ensemble voices, although the ladies are certainly wonderful as well (especially in “Bushel and a Peck”). Several of the numbers, such as “Sit Down, You’re Rockin’ the Boat’ and “Luck Be Lady Tonight” verge on being show-stoppers due to the power of the male vocals, not to mention the artful dance moves designed by Stacy Ashley. This choreographer has done an outstanding job taking old tunes to new places with clever motion and moves on a small stage, and musical director Mitch Chakour tempers all the strong ensemble voices to sound as one. The orchestra plays sweetly and smartly from a balcony above the actors. Bravo! Even with all of these elements in its favor, it is in the minor moments that this production shines most brightly. (Like the ensemble character who staggers out of a bar with a bottle, sees a pretty lady, and delicately douses himself with liquor in lieu of cologne before addressing her.) Company folks (BOTH men and women) of this show should be given medals for going above and beyond in their roles. Costume Designer Dawn McKay needs to come in for some kudos, too, for the colorful patterns and stylishness of all the period clothing. Scenery by Greg Trochlil makes the most of the space with multi-level performance areas, and many authentic old-time touches (the pay-phone is incredible). Lighting by Daniel David Rist is bright and effective for an old-fashioned musical… need any more be said? Guys and Dolls is a truly entertaining and enjoyable production. The performance by Che Malambo had all the attributes of a championship sporting event: athleticism, agility, team work, competition, and shear exhilaration! 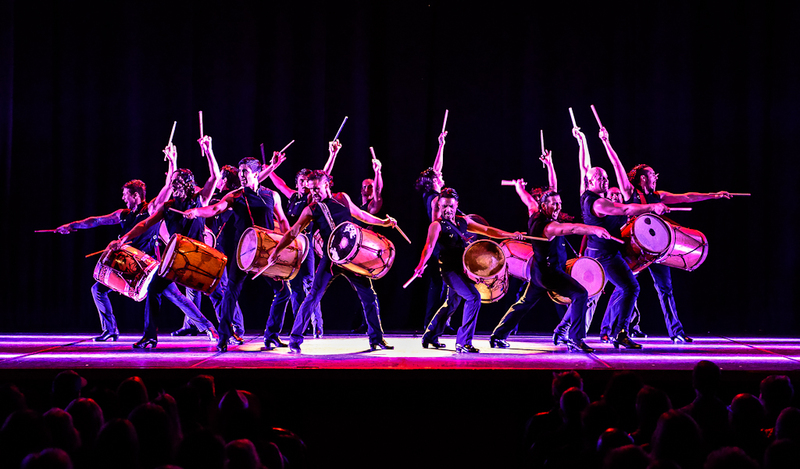 The program was a percussive explosion with fast precision footwork, Argentinian bombos drums and the striking of metal tipped boleadoras. The footwork (zapateado) was accompanied in some pieces with hand clapping (palmas), giving it a Flamenco flavor. Overall these 12 male performers offered a blend of highly trained sophistication with the excitement of street dancing. Costuming was minimalistic black throughout, so as not to distract from the dancing and rhythms. The opening featured 12 performers drumming and dancing simultaneously. The accompanying footwork was complicated, with some even performing while standing on the toe of their boots; a technique often demonstrated in contemporary percussive Celtic dancing by women. The one-upmanship became more intense as groups confronted one another and conversed through competing rhythms. The piece ended with a cohesive, tight choreography of the men once more unified. The next routine offered subtler sounds from the soloist’s slapping of his bare feet on the wooden stage floor. He executed an excellent “over the top” jump that was reminiscent of Gene Kelly. Once joined by other barefoot members of the troupe, they all together juxtaposed high martial arts kicks with gentile Argentine Tango forward ochos. In another set, a guitarist sang several pieces, some accompanied by a drummer. Several members joined to establish the percussive background with their hand clapping and footwork. About midway through the 90-minute program, a soloist entered with boleadoras, a lasso with metal tips affixed. Originally used as weapons by the gauchos, it has evolved into a spectacular art form. Much like the fire-lit pois seen in Polynesian dance performances, these appeared to have LED lighting, which enhanced the overall effect. They became hypnotic as they twirled through complex patterns and stuck the wooden floor rhythmically. The second portion of the program fused all the percussive techniques together: footwork, drumming, and boleadoras. At times the rapid pace sounded like the finale of a fireworks show. The well-deserved standing ovation led to a dazzling encore. “The Age of Innocence” becomes a painting of the beautifully stunning New York City at the turn of the last century. Life was slower, pretense was ever-present, and the class-system was dictate. We see characters walk through their perfectly steadfast stations in time, exquisitely designed because no less would suffice. These people are the nouveau riche. The story depicts a love triangle, with weak Newland at the center, bookended by sweet fiancé May and scandalous cousin Ellen. It is important to know that “scandal” of 1920 meant outcast and scorned for behaving in ways that are different from the norm. Ellen is a woman about to be divorced – hardly of any consequence by today’s standards. The story is told with the advantage of hindsight. Boyd Gaines (The Old Gentleman, aka Newland’s older and wiser self) portrays the most believable character. He speaks directly to the audience. 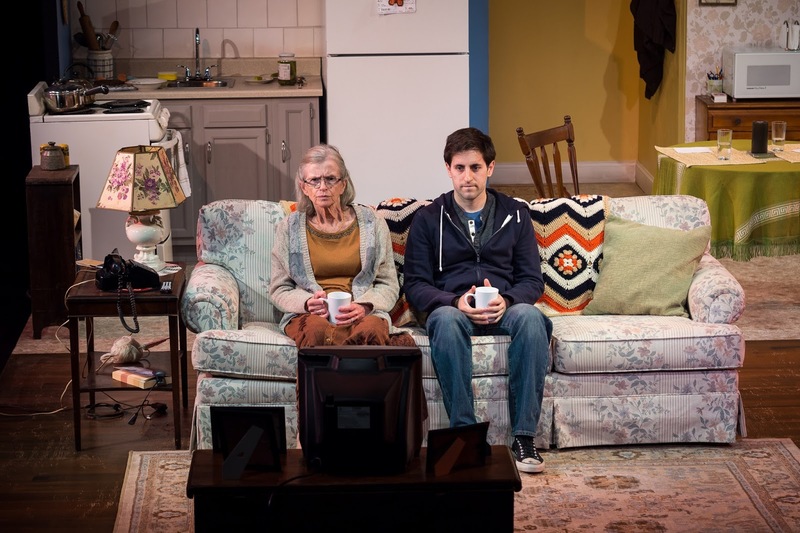 Gaines’ subtle movements on stage often mirror those of actor Andrew Veenstra’s young Newland. We see and hear the anguish of the love-tortured man through Gaines’ character’s retrospect. It is a stretch to compare Gaines to Veenstra, especially physically. While Veenstra displays acting skill and might be excellent in another play, he is miscast in “Innocence” – a primary reason being his seemingly boyish age. Sierra Boggess presents a sophisticated warmth and sensitivity to Ellen as a woman put in an unenviable position by the mores of the time. Boggess is given the opportunity, albeit short, to sing in her lush soprano voice. While most audience members may count Helen Cespedes in a supporting actor category, she gives May a demure and dull façade while simultaneously determined and wily. Cespedes successfully creates an unassuming girl turned woman in a flash. Director Doug Hughes and Scenic Designer John Lee Beatty have shaped an extraordinary backdrop for the characters. The set is elegant, at the same time uncluttered so that the comings and goings of those onstage is smooth and clear. Linda Cho’s costumes could (should) win awards. All actors (female and male) are bedecked extravagantly as becoming the era and class. Yet, perhaps extraordinary, extravagant, and exquisite can be a bit overpowering. In the case of “The Age of Innocence,” the trappings sometimes distract from the characters and the actors’ talents. Edith Wharton, author of the Pulitzer Prize winning novel “The Age of Innocence” would feel at home watching Douglas McGrath’s adaptation of her work. My guess is that McGrath’s task of condensing this classic dramatic story into an hour and forty-minute play was extremely difficult. Kudos to him. Revered as the world’s third oldest ballet company, the Royal Danish Ballet returns to Jacob’s Pillow for the first time in over a decade to open Festival 2018 in the Ted Shawn Theatre. Praised as “a master class in style” (The Guardian), leading principals and soloists perform a program of pas de deux, imbued with a rich Danish-Pillow history which dates back to company’s U.S. debut of the first group of soloists in 1955. 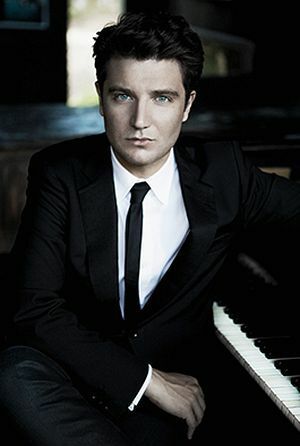 While the distinctive repertoire of Danish choreographer August Bournonville remains a cornerstone for The Royal Danish Ballet, in his ten years as Artistic Director, Nikolaj Hübbe has brought the company to an impressive technical level that masters a wide range of modern and classical ballets. The program includes eight pieces, including “Swan Lake,” Napoli,” and Dvorak’s pas de deux. There are evening and matinee performances. 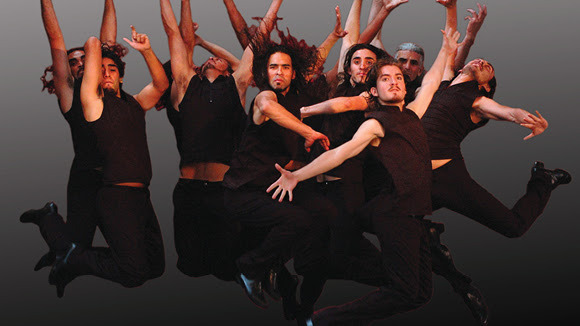 The Argentine based dance company, Che Malambo, excites audiences through precise footwork and rhythmic stomping, drumming of the bombos, and singing and whirling boleadoras (lassos with stones on the end). Presenting a thrilling, percussive dance and music spectacle, the company’s work celebrates the unique South American cowboy tradition of the gaucho. This powerhouse, all-male company of 14 gauchos is directed by French choreographer and former ballet dancer, Gilles Brinas. Che Malambo brings fiery Malambo traditions and virtuosic dancing to the contemporary stage for an exhilarating and entertaining. Malambo began in the 17th century as competitive duels that would challenge skills of agility, strength, and dexterity. Zapeteo, their fast paced footwork, is inspired by the rhythm of galloping horses in their native Argentina. In this farcical rebuke of religious and moral hypocrisy – particularly timely in today's world – Tartuffe, a wily con man who passes himself off as a pious puritan, has insinuated himself into the household of Orgon, a wealthy Parisian. The impostor has designs on his benefactor's fortune, as well as his attractive wife. 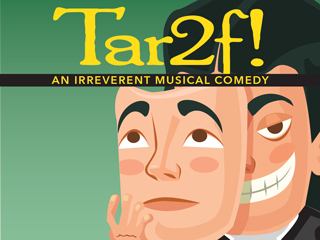 Members of the family are exasperated, then outraged, by Tartuffe's malign influence, as he plots to gain control of Orgon's assets, disinherit his son, marry his daughter and take over his house – along with his mind. The script updates Moliere's language without losing his incisive wit. In this face-off between love and greed, credulity and cynicism, is a framing device that parallels the crisis within the play, leading to a surprise climax. The tuneful score likewise reflects both the play's period and our own.